We understand the importance of a high quality external door that not only looks good but also provides safety and security for your home. All of our doors are manufactured in our own factory using the highest quality materials. 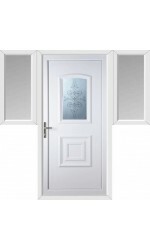 Our front uPVC doors can also be fitted as a back door for your home. If you choose one of our uPVC Doors as a back door, you may want to opt for a High Security uPVC door as all panels are reinforced with MDF for added security. Frame Style uPVC doors are also UV stabilised to ensure the colour will be maintained despite exposure to the toughest of British weather, along with being manufactured with a high level core which provides excellent thermal values. To make your door completely unique, you can add your choice of handles, letterboxes, numerals and knockers; choose from a range of different glass designs with their own privacy levels. Our glass panels are double glazed for thermal efficiency and extra security. 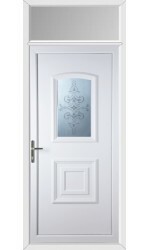 The Folkestone China Blast uPVC Door with One Sidelight by Frame Style. As with all of our uPVC doors, you can choose from three different colours: White, Rosewood and Light Oak. Call now for your best quote today! If your opening is larger than the measurements stated, please call us as you may require a sidelight or toplight. All uPVC doors from Frame Style are provided pre-hung in the frame, prepared for installation. 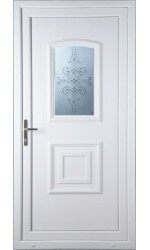 Both the door and frame are manufactured from 70mm, grade ‘A’ virgin polymer. The door, frame and 28mm uPVC panel have been UV stabilised, shielding it against discolouration. uPVC doors do not require any painting, touch-ups or further maintenance, except an occasional wipe down to remove dust and dirt. Our uPVC doors come with toughened glass for safety and security reassurance. As the glass is also double glazed, it helps increase the thermal efficiency rating. All manufactured doors come with a 6 point locking system, but you can consider upgrading to a high security 10 point locking system. As standard, three keys are supplied with each door. Door handle options are available in Black, White, Chrome and Gold. All of our uPVC doors are made to measure and you can choose from three different colour options: White, Rosewood and Light Oak. 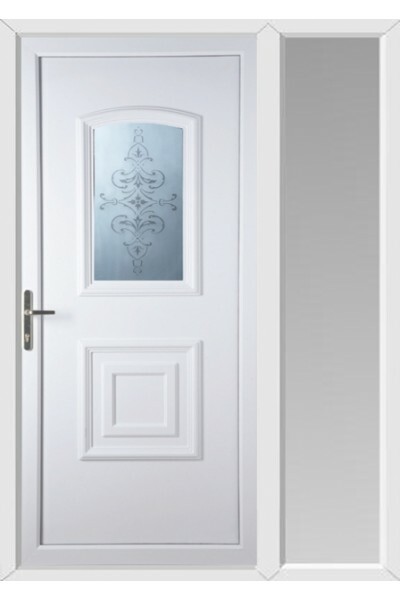 Every uPVC door and its frame are manufactured from 70mm, grade ‘A’ virgin polymer. The door, frame and 28mm uPVC panel has also been UV stabilised, shielding it against discoloration. All of Frame Style prices quoted are inclusive of VAT and our 10 year insurance backed guarantee. Here are the glass options we offer. Note: The clock in the background is to demonstrate the privacy level of each design, and is not part of the glass design. All Frame Style doors are available in three different shades: White, Rosewood or Light Oak. Rosewood is considered the new Mahogany, and Light Oak is a lighter alternative. Both of these shades add a wood-like finish to your uPVC door. These finishes add a wood effect look to your uPVC door. •	White inside, White outside. • White inside, Rosewood outside. •	Rosewood inside, Rosewood outside. • White inside, Light Oak outside. •	Light oak inside, Light Oak outside. Here at Frame Style®, we offer top quality uPVC doors on a supply basis to domestic and trade markets. Select the door design that best suits you - take some time to look through the collection we have on display and find the perfect door for your home. Can I fit the door myself? – All of our doors are supplied pre-hung in the frames and are ready to install. To make things even easier for you, you can choose to have an installation kit, at a small cost, which includes 2x white silicone tubes and nozzles, correct drill bit, frame fixing bolts and torx bit. Design your door – Using the drop down menus above choose what accessories you would like on your door, the glass design you would like and the colour of your choosing. Add to Basket – Once you are happy with your options and the price click “add to cart” and go through the checkout process. AS you are purchasing the door on a supply only basis, we will require full payment on the site, either via credit/debit card or PayPal. Once you have your door, remember to register it in order to take advantage of our guarantee. Numerals are available black, gold and chrome. Spyholes are available black, gold and chrome. Please note: Please inform our surveyor at time of order if you would like to have your spyhole at a certain height. Then ensure the order form states either the height you wish it to be at, or for the spyhole to be sent loose for the installer to fit at time of installation. Our letterplates are sprung and are fitted with internal draft exclusion brushes. They are available in white, black, gold and chrome. A sill sits under your threshold, across the bottom of your door, and directs water away from your home. If your house requires a sill, it forms part of Building Regulations. A sill will be required if your house has brickwork below your door. If your doorway is sat on a concrete or stone step, then you probably will not require a sill. Our surveyor will advise you if your door requires a sill or not. Knockers are available in black, gold and chrome. Our standard uPVC threshold is 70mm in height. The Low Aluminium Threshold is only 14mm high on our Composite Door and 29mm high on our uPVC doors. A lot of people find the low aluminium threshold more robust and also reduces a potential trip hazard - for those with limited mobility. Please Note: A low threshold is not suitable for some properties due to the internal height of the flooring. Our surveyor will advise you if it is suitable for your home. Our doors come as standard with a lever / lever handle configuration; which means that you will need to use the key to lock or unlock your door, whether you are inside or outside. With a Lever / Pad handle you will need to use the key from outside every time. 1. With a Lever / Pad handle you still need to push the handle up and turn the lock with your key for your door to be fully secure. If you only pull the door closed then it is only locked on the center keep. 2. With a Lever / Pad handle you can get locked out of your house if you do not take your key when you step outside. You can also rest assured knowing that we are corporate members of the Guild of Master Craftsmen, CERTASS and FENSA. We have been vetted by several leading organisations within the exterior doors installation sector, so you know we stand by our word. Once you have received your door we encourage you to “Register Your Door” with us so if anything should go wrong then we would want you to be covered. •	Frames are protected about any failure in welded joints and distortion in accordance to suppliers’ recommendations for a period no longer than 10 years from the date of installation. •	All glass-sealed units are guaranteed against the failure of hermetical seals (i.e. misting between two panes of glass) for a period of no longer than 5 years from the date of installation. •	The guarantee DOES NOT protect you against scratched or broken glass after installation. •	Stained glass and lead work ARE NOT guaranteed against fading or discolouration. •	All door panels are guaranteed for a period of one year from installation against warping and twisting. •	Locking mechanisms, hinges, and all metallic moving parts are protected for one year subject to proper maintenance by the customer. •	Deterioration to door furniture (handles, letter boxes, knockers etc.) due to wear and tear or general weathering ARE NOT covered by the guarantee. Further details are available on request. Frame Style are committed to offering the best customer service and buying experience in our industry, that’s why your queries will always be answered by door specialists, 7 days a week. We deliver NATIONWIDE within 7-10 days of placing your order using our own delivery vehicles and not third-party carriers. One price for the first item, all subsequent orders are delivered FREE! For FREE advice from our experts on fitting, deciding on your new door, accessories and everything you need to know,. Call Us Now on 0800 211 8933. We accept payments from all major UK credit cards and paypal payments. Fensa Registered, stockists of high quality, low cost doors. Frame Style, Unit 2, Confederation Business Park, Lowfields Way, Leeds, West Yorkshire.